Vascular plants (from Latin vasculum: duct), also known as tracheophytes (from the equivalent Greek term trachea) and also higher plants, form a large group of plants (c. 308,312 accepted known species ) that are defined as those land plants that have lignified tissues (the xylem) for conducting water and minerals throughout the plant. They also have a specialized non-lignified tissue (the phloem) to conduct products of photosynthesis. Vascular plants include the clubmosses, horsetails, ferns, gymnosperms (including conifers) and angiosperms (flowering plants). Scientific names for the group include Tracheophyta and Tracheobionta. Vascular plants have vascular tissues which distribute resources through the plant. This feature allows vascular plants to evolve to a larger size than non-vascular plants, which lack these specialized conducting tissues and are therefore restricted to relatively small sizes. In vascular plants, the principal generation phase is the sporophyte, which is usually diploid with two sets of chromosomes per cell. Only the germ cells and gametophytes are haploid. 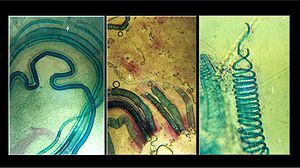 By contrast, the principal generation phase in non-vascular plants is the gametophyte, which is haploid with one set of chromosomes per cell. In these plants, only the spore stalk and capsule are diploid. ^ Christenhusz, Maarten J. M.; Reveal, James L.; Farjon, Aljos; Gardner, Martin F.; Mill, R.R. ; Chase, Mark W. (2011). "A new classification and linear sequence of extant gymnosperms" (PDF). Phytotaxa. 19: 55–70. ^ a b Smith, Alan R.; Pryer, Kathleen M.; Schuettpelz, E.; Korall, P.; Schneider, H.; Wolf, Paul G. (2006). "A classification for extant ferns" (PDF). Taxon. 55 (3): 705–731. doi:10.2307/25065646. ^ Christenhusz, Maarten J. M.; Zhang, Xian-Chun; Schneider, Harald (2011). "A linear sequence of extant families and genera of lycophytes and ferns" (PDF). Phytotaxa. 19: 7–54. This page was last modified on 3 February 2017, at 04:35.